Squarell FMS/CANbus interface by Squarell Technology. 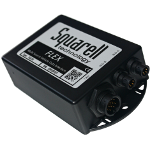 Squarell FMS/CANbus interface is a universal retrofit vehicle data interface, capable to obtain a comprehensive and standardized data set from a wide range of vehicles. Utilizing the unique contactless reader CANcliQ it allows to install the devices quick, easy and safe. The solution is designed to integrate seamless with tracking devices and other On Board Units by common and standardized protocols such as J1939/FMS, RS232 and Bluetooth.